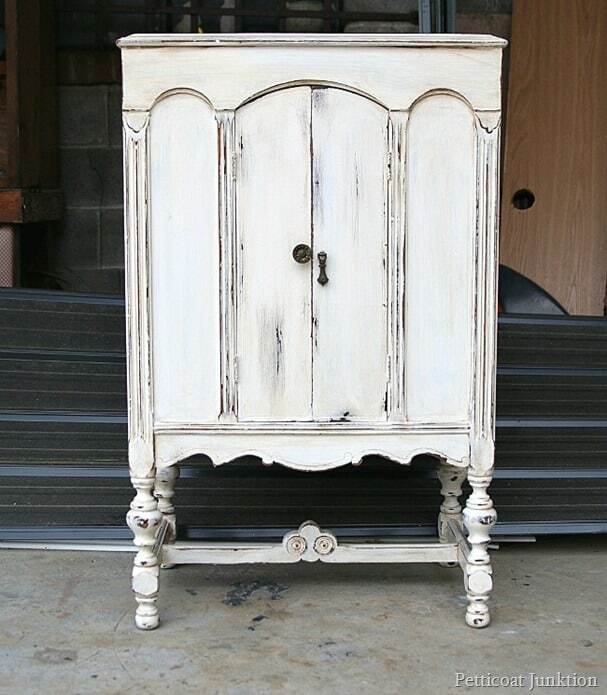 I love, love, love, vintage radio cabinets……and white paint. 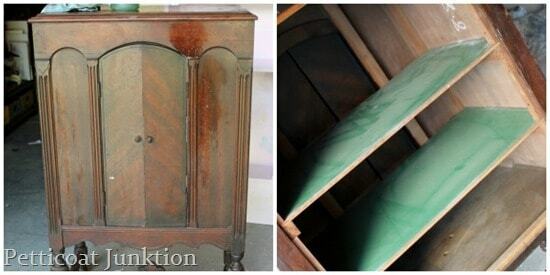 I’ve found several of the radio cabinets in my junkin’ travels and painted all of them. This one is a redo. ..metallic silver with a white wash finish. The cabinet has been at the shop forever so a redo was in order. I had so many people tell me how much they liked the finish ….and yet….it didn’t sell. I was getting ready to repaint it and someone walked in the shop and asked me how to get that metallic look. Go figure. The cabinet came from the Nashville Flea Market. 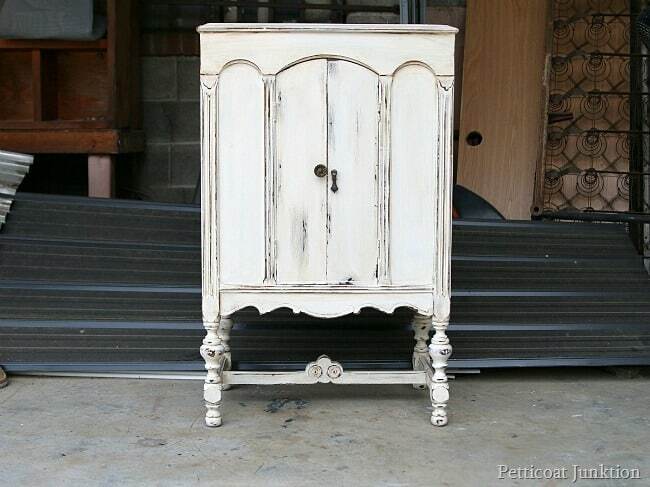 I think distressed white paint is one of my favorite furniture looks. 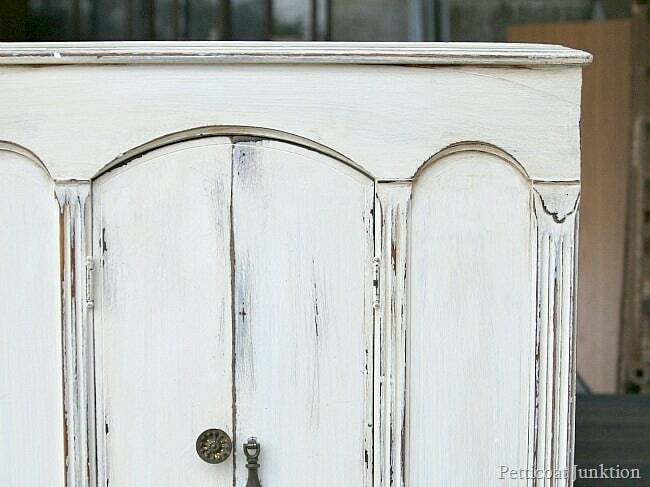 After painting and distressing the cabinet I applied Caromal Colours Toner to achieve an antique finish. 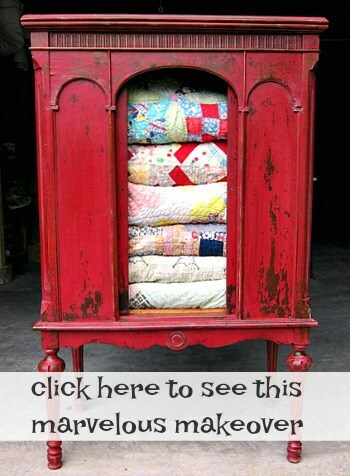 You can find a complete tutorial on the antiquing process at….Tutorial-How To Antique Painted Furniture. I love the details on the bottom leg support. Or whatever that thing is called….anyway I like those little round detailed wood circles. I had a helper while taking photos of the cabinet at the shop. My granddaughter Sofi. She has such a beautiful smile. Do you guys like the cabinet now? I have another radio cabinet that is everyone’s favorite. It’s my signature piece. See it here…Wowed By Tricycle Red. Hi Kathy! I love your blog and all your creations! I was wondering if you had ever used a General Finishes top coat and then put antiquing glaze or wax over that. 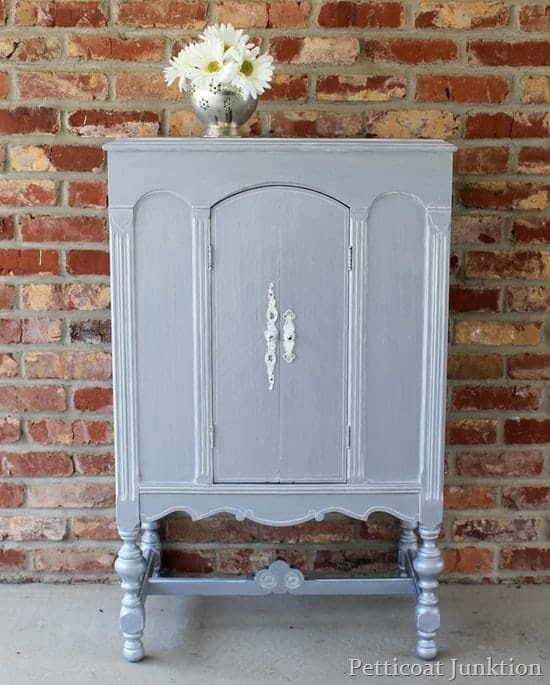 I painted a cute cabinet and didn’t think I wanted a darker antique look but now I’ve changed my mind and am worried I have to start all over! Thanks for all the inspiration! 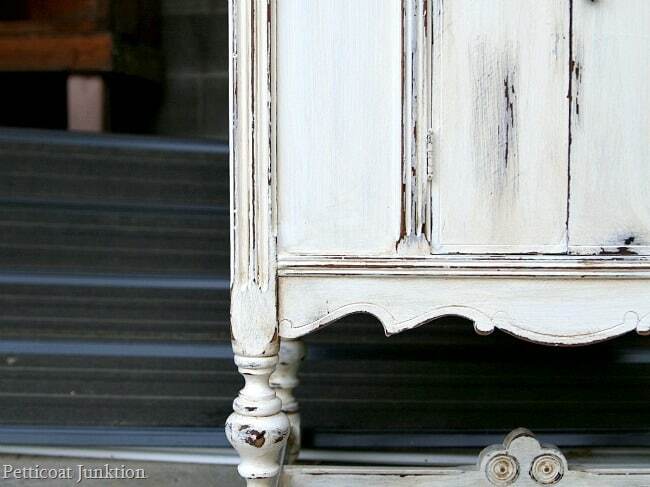 Love all your painted furniture! Thanks for the nice compliments. I have used General Finishes Top Coat but never put anything over it. I would give it a try before starting over. It can’t hurt anything. Good Luck! For just a brief moment, since your title said redo, I thought maybe you had painted over the red one! Phew, I’m glad you didn’t! Although this one is very lovely as well! Wow Kathy, absolutely marvelous. Piece looks really different. I love it. Would definitely purchase painted white like this. Both grandmother’s owned cabinet radios! Wonderful memories. Thank you. I love radio cabinets…in case you can’t tell, lol. I wish I were close enough to purchase this piece. I never see these where I live. I have always admired the red one. I am sure shipping cost would be more than your asking price for this piece. Yes, prefer the distressed white. Thank you. I like the white much better. Everyone likes my red cabinet. It’s a keeper. I like it both ways; HOWEVER, it has so much more character antiques. It makes me want to stop and admire it rather than walking by with a quick glance. Social, I’d like to sit and chat with her. I imagine she has some interesting stories to tell! I hate auto correct! Sofi…not social. Yep, that auto correct is heck. It always wants to do that on Sofi so I have to be careful! I like the white distressed look on this piece much better and have no doubt it’ll sell for you. Your granddaughter is adorable Kathy. 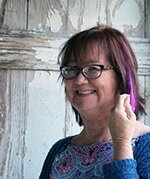 I’m enjoying your Seashell Craft series too by a lot of bloggers I already follow. Looking forward to seeing them all over the next three days! Thanks Marie, I like the distressed look too. Be here tomorrow for my seashell craft! Yeah, the off-white distressed paint isn’t as formal as the silver. Sofi is growing fast and she’s my little doll. I think the leg support is called a stretcher. Thanks Fonda, and I did not pinch Sofi’s cheeks, lol. She was playing outside and got just a little pink. If I went with red I would be too predictable.